Dust, drugs and death world is recalled by the Coen Brothers at a luxury hotel beside the sun-dappled Mediterranean. The American siblings' latest film, "No Country for Old Men," is a tale of murder amid the stark west Texas landscape that has impressed audiences and critics at Cannes Film Festival. At its center is an aging sheriff, played by Tommy Lee Jones, trying to catch a killer and make sense of a world in which violence seems to have no end. "It's about his character confronting a violent, horrible, bleak, unforgiving world, and trying to come to terms with that," said a cheerful Ethan Coen, who wrote, produced and directed the film with his elder brother Joel. The luxury hotel room where the brothers are sitting, with its panoramic views of the Riviera, seems a million miles from the movie's hardscrabble Texas terrain. The Carlton Hotel is a hub of Cannes glamour, with a celebrity clientele and rooms named after famous stars. The Coens spoke to The Associated Press in the sprawling Sean Connery suite; the Sharon Stone suite is next door. The brothers remain refreshingly down to earth, dressed in jeans and looking slightly rumpled after several days absorbing Cannes' reaction to their movie - one of the biggest hits of the festival so far and a front-runner for its top prize, the Palme d'Or. Trade magazine Variety called it "one of the their very best films, a bloody classic of its type." The Hollywood Reporter praised the film's "electrifying mood." It's a good year for Americans at Cannes, with several U.S. films generating a buzz, from David Fincher's serial killer saga "Zodiac" and Gus van Sant's skater-boy story "Paranoid Park" to Michael Moore's health care documentary "Sicko." 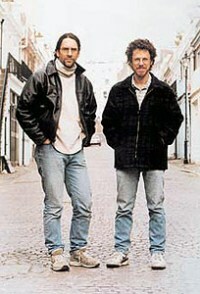 It's an especially good year for the sibling team European cineastes refer to as "The Brothers Coen." The Coens are grateful but philosophical about the attention. "You come here to amplify the attention for the movie, so you take whatever you can get," said Joel. The brothers - who won the Palme d'Or in 1991 for "Barton Fink" - are known for stylish films like "Fargo" and "The Big Lebowski" that mix violence with deadpan humor. Their last two pictures have been lighter fare: the George Clooney-Catherine Zeta-Jones divorce comedy "Intolerable Cruelty" and the Ealing comedy remake "The Ladykillers." The brothers' darker side is back with a vengeance in "No Country," which harkens back in tone and Texas setting to their first film, the noir thriller "Blood Simple." Set in 1980 and adapted from a novel by Pulitzer Prize-winning writer Cormac McCarthy ("The Road"), the movie begins on typical thriller terrain. Vietnam vet Llewelyn Moss (Josh Brolin) stumbles across the aftermath of a drug-gang shootout. Amid the bodies lies a briefcase containing US$2 million in cash, which Llewelyn takes home to his wife Carla Jean (Scottish actress Kelly Macdonald, adopting a convincing Texas twang). In hot pursuit comes Anton Chigurh, an enigmatic, implacable killer - a terrifying, deadpan performance by Spanish actor Javier Bardem - who is determined to get the money back. So far, so conventional. But the story soon veers in unexpected directions. Joel Coen - at 52 the elder by three years - admits the filmmakers had to walk "a delicate line" with moviegeoers. "They're expecting certain things from a certain kind of story," he said. "But those things could end up being boring and routine." He said the brothers' goal was to deliver "something which you hope is equally satisfying but is not necessarily what they expected. If it's unexpected it can be more entertaining or more compelling." The vast spaces of west Texas are almost a character in the film, as they are in McCarthy's book. The brothers say it was important for them to film on location in the area, basing part of their shoot in the small town of Marfa, Texas. Like the taciturn Minnesotans of "Fargo," the film's weather-beaten characters seem deeply rooted in their harsh and isolated locale. "It is hard for us to tell a story without connecting it to the region or the landscape somehow," said Joel. "It's so obvious from the novel that it's written by somebody who knows the region and who knows who lives there and even what the natural history of the place is," added his brother. "Cormac is a great describer of nature and it's all very real. "Like the novel, like the story, with the landscape you wonder: is it really incredibly bleak or is it beautiful? It's kind of both."